Promising Nigerian striker Ola Bello will no longer take football as a hobby, but an occupation, after putting pen to paper on a new deal with EFL Championship club Ipswich Town. The official website of the Tractor Boys has reported that Bello and twelve other teenagers are to join the Academy full-time next season and were introduced to the crowd at half-time during Saturday's match against Hull City. 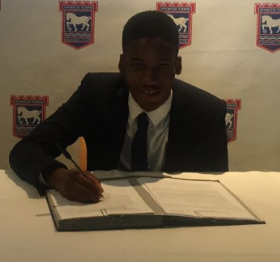 Bello has scored plenty of goals for Ipswich Town's U16 team this season and has also featured for their U18 team. He has been described as an all-action centre-forward who knows where the back of the net is by the Ipswich Town coach, according to East Anglian Daily Times. He has very good athletic attributes, is quick and agile and has the desire, work-rate and commitment to score goals in and around the box. Ola Bello's scholarship deal with Ipswich Town will be activated on July 1, 2019.